Ecotax (short for Ecological taxation) refers to taxes intended to promote ecologically sustainable activities via economic incentives. Such a policy can complement or avert the need for regulatory (command and control) approaches. Often, an ecotax policy proposal may attempt to maintain overall tax revenue by proportionately reducing other taxes (e.g. taxes on human labor and renewable resources); such proposals are known as a green tax shift towards ecological taxation. The idea of ecological taxation appear to be promising - add taxes to polluting (or otherwise "environmentally expensive" products, so their price will include the cost of the product to the environment. I want to know if there's been places where such taxes actually helped reducing consumption of "environmentally expensive" products? Did the taxation work in these cases better then other methods? (like education) On the other hand, are there cases where Ecological taxes were "abused"? In short, you can do less evil for the same price. 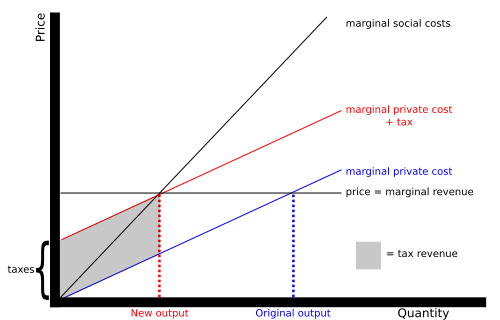 The blue line shows the quantity/price without taxes and the red line with a Pigovian tax. Tax revenue (gray) is also generated. Analysis of a well-composed program for Mexico City indicates that the emission reductions would cost 24 percent more if a tax on gasoline was not introduced. This paper attempts to integrate the theory of optimal taxation with the analysis of the use of indirect taxation to counteract negative external effects (Pigovian taxes). A first-best solution to the problem of the optimal tax on an externality-generating good is contrasted with the case where the government also needs other, distortionary taxes in order to satisfy its revenue requirements. The main result is that the Pigovian principle holds in a modified form in the latter case as well. However, according to Fullerton and Wolverton, a Pigovian tax is equivalent to a combination of presumptive taxes (that affect everyone) and environmental subsidies (to those that act more environment-friendly). The claim is that the two-part tax instrument is easier to enforce and enact in some cases. I'm guessing it would be appropriate for production taxes, while a simple Pigovian tax would be more effective for consumer goods. This paper builds two simple general equilibrium models to demonstrate the equivalence between the Pigovian tax and the combination of a presumptive tax and an environmental subsidy. [...] Compared to the Pigovian tax, a two-part instrument may be easier to enforce, may be easier to enact, and can still force the market to recognize the social cost of disposal. Summa summarum: there is evidence that Pigovian taxes in general and ecotaxes specifically have been and are effective. They aren't the only possible solution, and not always the most effective one. The Dutch coal mistake is supposedly goig to be rectified by 2030, according to the latest news using the more traditional means of closing plants down, which is basically a capping scheme. Norway has had a carbon tax since 1991, roughly $72 per metric ton for the offshore oil and gas industry (rates vary by industry). At the same time, the country banned the practice of burning natural gas that comes up with the oil—all the CO2 for the atmosphere with none of the energy benefits—known as flaring. And, thanks to the tax, Norway hosts the world's largest CO2 storage project at its offshore Sleipner natural gas field, where millions of metric tons of CO2 have been pumped under the seafloor rather than dumped in the atmosphere. "We are by far the most carbon-efficient producer of oil and gas," says Hege Marie Norheim, senior vice president for corporate sustainability at Norway's state oil producer Statoil. But a carbon-efficient oil and gas producer is still an oil and gas producer, which shows that a tax on carbon—even a relatively high one—is not a panacea. Since 1991 Norway has exported more than 16 billion barrels of oil. Each barrel meant 430 kilograms of CO2 entering the atmosphere when used. So Norway's oil production has added nearly eight billion metric tons of CO2 to the atmosphere when used after export to other European countries. This is the problem of leakage: Norway's carbon tax stops at Norway's borders, unlike its oil exports. Alas it's probably very difficult to find a comparative study of the alternatives (to Pigouvian tax) which isn't theoretical/hypothetical... you can't turn back time and most of these polluting industries have large costs so experimental economics is generally out of the question. On thing that is known experimentally (and coincides with common knowledge) is that offering Pigou subsidies is better from a psychological acceptance standpoint than imposing Pigou taxes, especially under partial information. For instance when a government subsidizes clean/renewable energy, it's offering a Pigou subsidy. Permanent renewable energy subsidies are not only an expensive choice to reduce emissions. They are also a very risky instrument because small deviations from the second-best optimum lead to strong responses in emissions and welfare. If the subsidy was set 2% below its optimal value, emissions would increase by 18%. In contrast, if the subsidy was set 2% above its optimal value, welfare would decrease by an additional 3% due to an over-ambitious emission reduction. Traditional policies to promote cooperation involve Pigouvian taxation or subsidies that make individuals internalize the externality they incur. We introduce a new approach to achieving global cooperation by localizing externalities to one's peers in a social network, thus leveraging the power of peer-pressure to regulate behavior. The mechanism relies on a joint model of externalities and peer-pressure. Surprisingly, this mechanism can require a lower budget to operate than the Pigouvian mechanism, even when accounting for the social cost of peer pressure. Even when the available budget is very low, the social mechanisms achieve greater improvement in the outcome. It's hard to tell how something like that translates to a big scale like in a country or between countries. Uncharted waters. However countries putting political (and ultimately military) pressure on others is not unheard of... so who knows, maybe it applies. They do mention some (obvious) caveats: like "negative peer pressure may result in retaliatory action, especially when it is perceived as illegitimate, a phenomenon that has been observed across many cultures. Thus, peer enforcement can turn prohibitively expensive if peer pressure ends in a chain reaction of retaliation." Vendettas and so forth. And a "second caveat is that the success of peer pressure relies on effective monitoring of peer action". Not the answer you're looking for? Browse other questions tagged environment taxes . Has anyone noteworthy given up their US citizenship to escape taxation? Does one acre of hemp yield as much paper as 4 acres of trees?